This Minty veg pulao - Pudina rice recipe may be cooked as a one dish meal as well as a main dish on special occasions as well as for parties. It is a good dish to take to office or school for lunch. It can be served hot, warm or at room temperature. It is a rice and vegetables dish, flavored with mint - pudina. Dry fruits, spices and herbs are used along with rice and vegetables. It can be served by itself as well with tomato raita, boondi raita or cucumber raita. 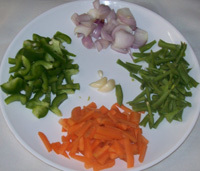 I used the vegetables my family usually likes, such as green beans, carrots and green peas. You may also add potatoes, capsicum, cauliflower. I am using basmati rice - Indian long grained flavored rice for this as it adds to the taste and looks to this mint pulao. But you may also use any other rice that you usually use. The taste and looks will change accordingly. Add rice to a bowl and wash 2-3 times or till water runs clear. Keep aside for about 30 minutes. Grind the ingredients given for grinding. Keep aside. Chop beans, carrots and (any other vegetables you are using). Heat the ghee/oil in a deep pan or kadai. Keep heat medium. Fry the cashew nuts, remove onto a plate. Add jeera - cumin seeds and bay leaves to ghee. Fry for a few seconds. Add the onions, fry for 2-3 minutes. Add beans and carrots and fry for 3-4 minutes. Add any other vegetables if adding. Add the ground mint/chili paste and fry for 5 minutes or till oil starts floating on top. Add 2 cups of water. Bring to boil. Add the tomatoes and the washed and soaked rice. Cover with a lid and cook on low flame for 5 minutes. Remove lid and mix carefully. You will see how the rice has puffed up. Add a tablespoon of water only if needed and cover again and cook till rice is just done. The vegetables will also cook within that time. Serve hot or warm with cucumber raita, tomato raita and papadam. 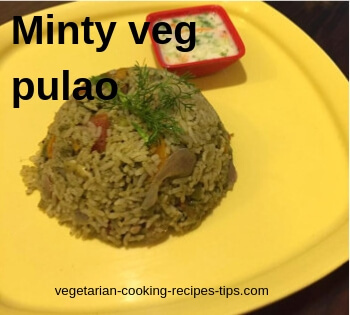 I am sure you and your family will enjoy this mint pulao recipe. You may use a mix of ghee and oil. 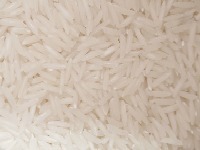 Basmati rice breaks easily when it is cooked, so handle carefully. You may keep this in fridge for 2-3 days. Heat and serve when you want.